Does the SelfieMaster SM-501 Easy Selfie Lens Really Work? If you like the results that you get from selfie sticks but don’t like the hassle of using them then this SelfieMaster SM-501 Easy Selfie Lens may be more to your liking. Almost everyone likes to take a pic or two of themselves and it just got a whole lot easier. The SelfieMaster SM-501 Easy Selfie Lens is designed to make taking inclusive selfies possible and easy to do. The claim is that by attaching the SelfieMaster SM-501 Wide Angle Selfie lens to your smartphone you will be able to take selfies with more people and landscape behind you. The hype is realized by the fact that taking selfies has exploded in the U.S and around the world. It has become a part of the fabric of life in a social media driven age. 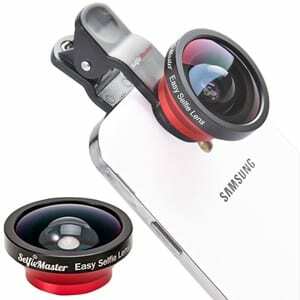 The cost of the SelfieMaster SM-501 Easy Selfie Lens is only $25.99. There are others that are less money but the quality of this unit makes it worth the few extra dollars. Not much commitment required for this unit. When you want to take a wide angle selfie you simply clip the SelfieMaster onto a smartphone and click away. When not in use you simply pop on the lens cap store it in the storage bag that is included with the purchase of the SelfieMaster. Pretty simple. The SelfieMaster SM-501 Wide Angle Selfie lens is a great way to get more inclusive pictures when taking a selfie. Easy to use and well made it does exactly what it is supposed to do and makes taking selfie more fun and much easier on the subjects as there is no longer the need to get so up close and personal with your fellow subjects. We are going to give this product a thumbs up rating. For anyone who loves to take selfies and want to include more people or more background this unit is for you. Well-made and pretty cheap in price if you love selfies grab and start clicking away! If you are interested in selfie sticks then we have talked about a few of those as well. What do you think? Does the SelfieMaster SM-501 Easy Selfie Lens work or not? Does Glow Bowl Really Work? Does the Repel Windproof Travel Umbrella Really Work?